Forget the media hype. The beaches of Mexico are the smartest vacation destination right now. it’s probably safer to be in the Mayan Riviera than many places in the US. AND you get a great discount on your vacation along with impeccable hospitality. What better place for the journey of beyond burritos to go international for the first time than the Yucatan peninsula? 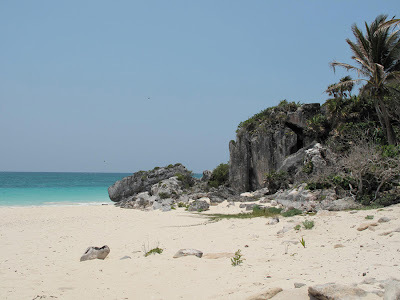 The beaches of Tulum are an hour and a half south of Cancun, and each resort is isolated to create a serene environment of its own. It was a feast for the mind body and soul let alone the stomach. 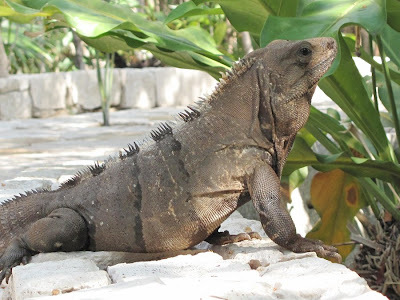 Apart from having beautiful fish eating bananas from our hands in the crystal clear ocean water, our encounters with the food in the Catalonia Royal Tulum all-inclusive resort were surprisingly surprisingly delicious and very satisfying. Our food adventure was limited to the resort since the authentic ingredients and wonderful hospitality gave us few excuses to leave. We ordered a combination appetizer that consisted of creamy guacamole, chicken flautas, steak sopes and huitlacoche (corn mushrooms/truffels) quesadillas. Atypical of most all-inclusive resorts, their food was thought out, very fresh and well prepared. 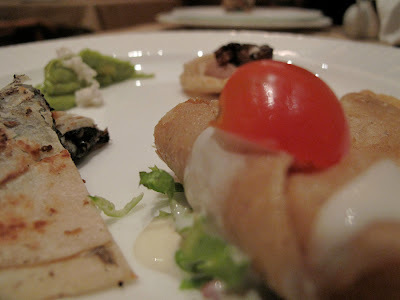 My favorite appetizer was the huitlacoche quesadilla. I'm not sure if it was the lack of hormones but cheese tastes so much fresher down south. For entrees we had a steak dish and a chicken burrito that did not merit pictures but both were quite tasty. 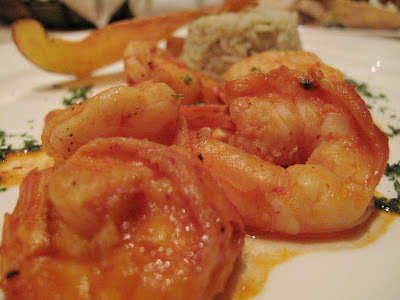 The shrimp above were a little overcooked but the sauce was delicious, and the shrimp themselves were very plump. Overall, they had just the right amount of heat with a garlic and tomato undertone. Mixing the sauce with the rice behind the shrimp was a delicate combination. 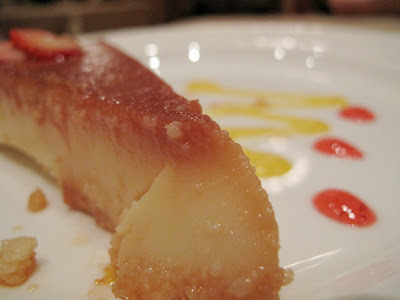 For dessert, we split a piece of coconut flan, which was unlike other flans in that the taste was much smoother and easier to enjoy. Overall, the Mexican food at the resort had Jaquie raving about the fresh ingredients that tasted just right. While the preparation of most dishes we tasted was not traditional, the flavors still hit home and satisfied our longing for real Mexican food. Jaquie's trip would only be complete if she had coco con chile, sal y limon (coconut w/ salt, lime and chile powder). Luckily our only trip outside of the resort to the ruins in Tulum, gave us the opportunity to savor this refreshing snack, which is native to the Yucatan. While Jaquie was in the bathroom of a hole-in-the-wall tourist bodega, I asked the guys to chop up some coconut using the machete sitting at the entrance. After we drank the water, the machetes were blazing and the hard round coconut became what you see above. 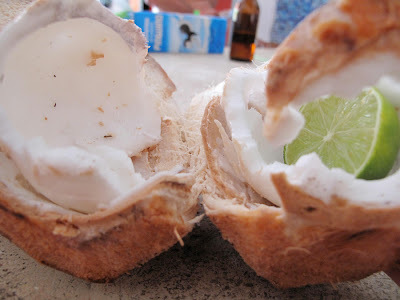 Laced with habanero chile powder, salt and limejuice, this plain ol' coconut was the highlight of Jaquie's trip and a new experience for me. A fun fact: Coconut was named after the Spanish word for boogeyman "el coco" because of it's three spots and hairy surface. Enjoy Cabo San Lucas resorts with fine restaurants on your Mexico vacation. Latin food vendor and Red Hook, Brooklyn seems to be synonymous in NYC's food world these days. Our much-anticipated visit to the Red Hook Ball fields was finally fulfilled last weekend. Note that the bold text is on purpose, since “filled” is an understatement because we were determined to taste as much as possible and may have crossed the line into gluttony. The Red Hook Latin food vendors have built up quite a reputation in recent years and have earned a following of Brooklynites and Manhattanites alike. Now we can add Queensites (doesn't sound as cool huh?) to the list. As we approached, my heart raced and I had butterflies in my stomach that were soon going to be drowned by aguas frescas (fresh waters). These are Mexican drinks that are similar to iced tea in that they are water based with a combination of different natural ingredients from fruits to flowers. I ordered my favorite, horchata, which is made with rice, almonds, cinnamon and vanilla. It has that nutty soymilk feel from the rice but it's much tastier and refreshing. Jaquie ordered jamaica (hibiscus) pronounced ha-my-ka. I, of course, asked for a few large gulps before she could drink it all. It tasted like a natural flower cool-aid if you can imagine that. We walked up and down the block trying to choose wisely and decided to wait on the longest line. We figured people must have been waiting for a reason. So, we waited to savor the Salvadorian pupusas (thick tortillas stuffed with cheese, meat, beans or loroco). Loroco was a new discovery for us. It's a flower grown in El Salvador and used in many native dishes. I get excited when I find new food; it fuels our exciting journey to discover the less known culinary treasures in Latin America and expose them to the world. As we patiently waited, I couldn't help my urges to try something from the lonelier Guatemalan cart next door. I asked a couple if I could take a picture of the enchiladas (above). They looked great, but they’ll have to wait for another visit. I was more curious to try another food that was new to us. A small handwritten sign read, "we sell pacayas". Pacaya is a bitter flower with stems resembling squid tentacles. It must be an acquired taste because it has an incredibly strong pungent aftertaste. The bitterness lingers for a while. It’s definitely a one-time deal for me, though the sauce was great and frying it helped hide the bitterness a little. Jaquie also mentioned she would use less onions to decrease the bitter flavor and add extra tomato-y sauce for the sweetness. For the record I'm a fan of extra sauce! We finally made it to the front of the pupusa line and were enthralled at the instinctual flow of the women preparing the meal. They grab the stuffing, place it inside the doe and roll it together until it's flat and round then smack it on the grill in less than 10 seconds. We had a loroco and a pork pupusa, both also stuffed with cheese. They were very delectable paired with a ton of pickled jalapeños, pickled cabbage, heavy cream and salsa. The pupusas themselves were like meat stuffed tortilla pancakes with the doe still moist inside. A different experience that is sure to become more popular as the world is exposed to this Salvadorian delicacy. It definitely made believers out of us. We finished the feast with the Mexican truck and indulged in a huarache, which in this case was essentially a HUGE taco. This huarache was too messy for a picture but just imagine a Monster Taco! On Jaquie's authenticity scale, the Red Hook huarache scores a 4 because what should’ve been a corn based dough that is slightly thicker than a tortilla was just a giant flour tortilla instead. We also shared a taco al pastor (spicy pork taco), which was one of the better tacos i've tasted in New York. The chiles de arbol (dried tree chilis) were deliciously soaked in olive oil and salt. It's curious to know that these "tree chilis" are actually not grown on trees. I wanted to take some shrimp ceviche to go from the Chilean cart, but early bird brooklynites had beaten me to the punch. I made the lady at the cart promise to bring more next time. The Colombian truck, while lively with the loud music, was lonely and had a variety of typical fried Colombian dishes. A little creativity would probably attract more customers. I suggested they make the milk-based fruit juices that I grew up loving. Though we were expecting more carts from all the hype, the experience was fantastic. I would recommend going with a few friends and spending a few hours on the picnic tables munching away the afternoon. Continuing on our journey to explore the passionate world of Latin cuisine, we embark on a mission to figure out which country reigns in the art of creating South America's beloved flatbread, The Arepa! A bit of research and common knowledge has led me to understand that Arepas are rooted deep in the cultures of two neighboring countries, Colombia and Venezuela. Leaving recent political rivalries aside, we put these two countries to the test in a Battle of the Arepas. Since Venezuela is credited for pioneering the Arepa movement in the US, we decided to take a trip to Brooklyn's Caracas Arepa Bar (718.218.6050/ 291 Grand St. b/w Havemeyer St. and Roebling St.). Located in the heart of gentrified Williamsburg, the ambiance of Arepa Bar is very hipster-trendy, using recycled and raw building materials as decorations. Their outdoor seating and open windows create the perfect springtime atmosphere. We arrived at the perfect time, exactly half an hour before people were waiting in line to be seated and the employees, who had been chatting with us about the place, began racing back and forth shouting orders in the already fast-paced Venezuelan dialect. To accompany the arepas, Venezuelans have created one of the most refreshing non-alcoholic drinks i've tasted, papelón. It's simply made of sugar loaf or panela (compressed sugar cane extract), water and lime. I would call it upgraded limeade! The papelón below was almost empty when I took the picture not only because of how refreshing it was but because it was Jaquie's drink. Her mutant ability is to absorb liquid very fast (Tribute to the X-Men craze). Split open like pitas and stuffed with a large variation of ingredients, the Venezuelan masa (dough) is a bit greasier than its Colombian counterpart. From what I understand, it's also consumed more commonly as a nighttime food in Venezuela whereas Colombians consume arepas mainly during breakfast. Before I get into what we ate, I have to admit that I have a weakness. If I see chorizo on a menu, any dish containing this spicy Spanish sausage becomes my number one choice. I think Jaquie has the same weakness because we ordered the only two arepas that had chorizo. The first was called Los Muchachos (The kids), which was stuffed with grilled chorizo, spicy crisped white cheese, jalapeños and green peppers. I was expecting a little more spice and it was a bit too greasy, but that's what you get if the main ingredient is chorizo. Overall very tasty and the crispy cheese added a crunch that went well with the arepa. Now let me introduce the competitor, the Colombian Arepa, which eaten alone is probably less enjoyable than regular white bread or a plain pita. Zero salt or oil is added creating a bland taste. It’s really all about the toppings, the crunchy exterior and the soft inner texture. Colombians traditionally place their toppings on top of the arepa, though the stuffed arepa is beginning to surface more and more as it crosses the barrier of homemade breakfast to a nighttime street food. Arepas Pues Mixtas (83-15 37th ave/ phone # does not work) is owned by a middle-aged Colombian couple that began their venture by selling arepas in Flushing Meadows Park. The chatty lady reminded me of one of my aunts because of her comforting nature. While she mentioned that they haven’t had much success with advertising, it looks like word of mouth seems to be working just fine for them because a few minutes after we arrived, the very small eatery was jam-packed with Colombian arepa lovers even after their closing time. 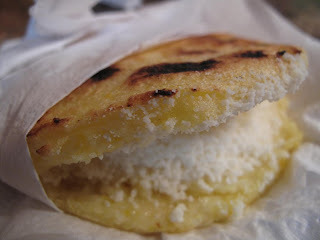 The place has no menu and only two choices: Arepa mixta or arepa with butter and cheese. The new aged, non-traditional arepa mixta has all the main proteins stuffed in one arepa. It starts with my absolute favorite tasting thing in the world, chicharron (pork rinds). Think not of the stuff you get in the bag but instead bacon on steroids. Next is a layer of chicken followed by shredded beef, which Jaquie enjoyed much more than I did. She described it as tender and juicy. I was too busy trying to dig up the chicharron. Lastly, it's topped with shrimp in salsa golf (ketchup and mayo) which is used on practically all Colombian street foods. We then had a more traditional butter and cheese arepa, which I thought would come served with the butter and cheese on top instead of inside, but I guess Arepas Pues Mixtas is sticking to their modern ways. You can do it yourself!! I've included a picture of a supermarket bought arepa which I toasted, buttered up and placed Colombian cheese and two eggs on top. This is the Colombian breakfast of champions.